NEW YORK — A new bill proposed in the New York City Council might stand in the way of retailers’ frictionless ambitions. Retailers that don’t accept cash, a small but rapidly expanding group, would be fined in the city under a bill introduced in the City Council on Nov. 28 by Ritchie Torres, a Democrat representing working-class communities in the Bronx. For the first violation, cashless operators would have to pay $250, and then $500 for every violation thereafter. If made into law, retailers would have 120 days to comply with the ordinance after its adoption. Torres, like an increasing number of lawmakers, believes a no-cash policy discriminates against lower-income consumers, who may not be able to afford credit cards or smartphones, now the only means of payment accepted at Amazon Go, the e-commerce giant’s cashierless convenience-store concept. 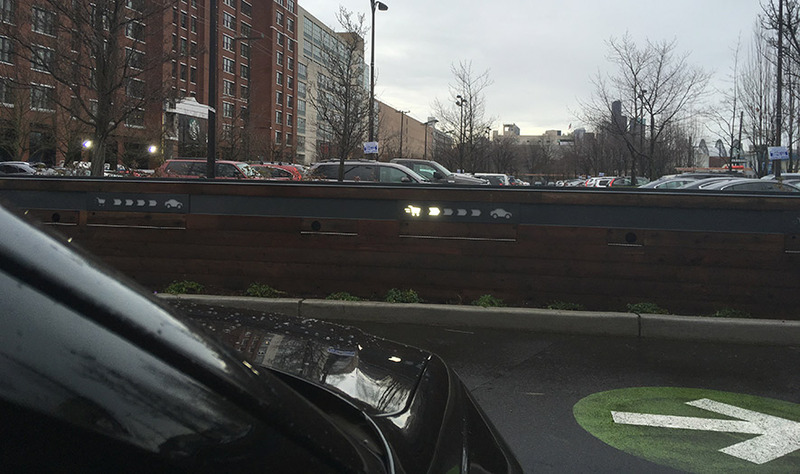 Over the next few years, Amazon is set to open 3,000 new Amazon Go units. Restaurant chains such as Sweetgreen, Starbucks, Dos Toros and Shake Shack have also opened cashless formats. The chains argue that eliminating cash speeds up service because money and change don’t have to be counted out to complete a transaction. In July, a Washington, D.C., council member introduced a bill barring cashless restaurants. If approved, the legislation would prohibit foodservice operators from not accepting cash, posting signs that they do not accept cash and charging different prices for cash vs. other forms of payment. The item is still under council review. Last November, Chicago’s City Council indefinitely postponed a vote on a proposal to ban cashless businesses. 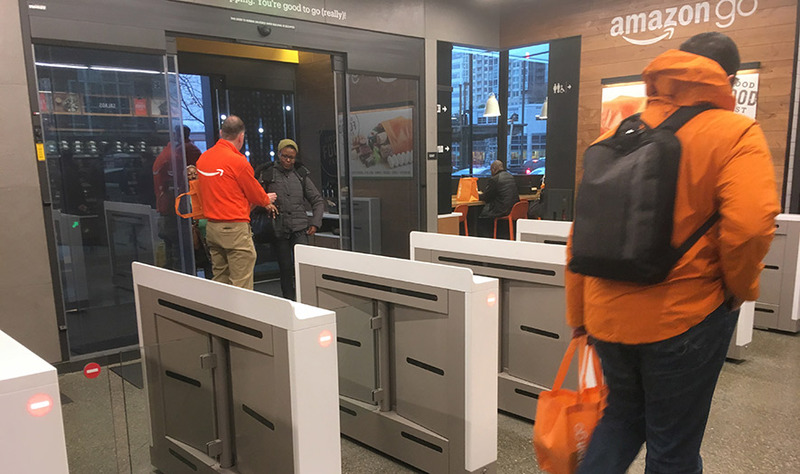 The city’s third Amazon Go location opened Nov. 27. 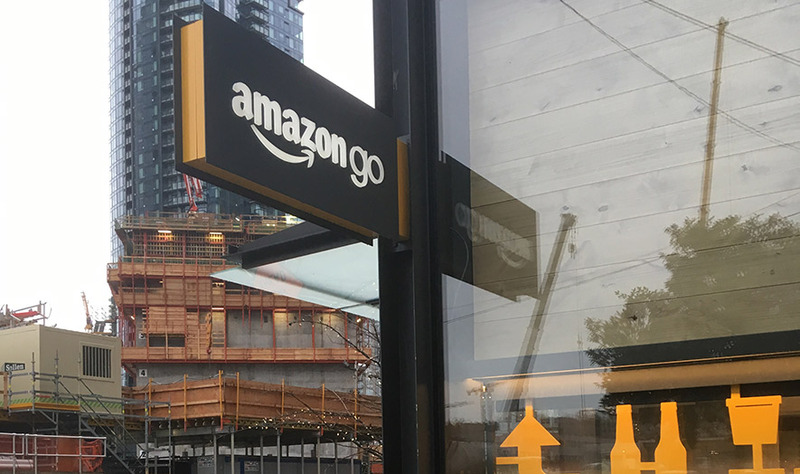 Editor's Note: On the heels of Amazon opening its cashierless convenience store, Amazon Go, to the public in Seattle, CSP Technology Editor Jackson Lewis flew to the West Coast to experience the new store and get a glimpse of what could be the future of retailing. Here's his report. 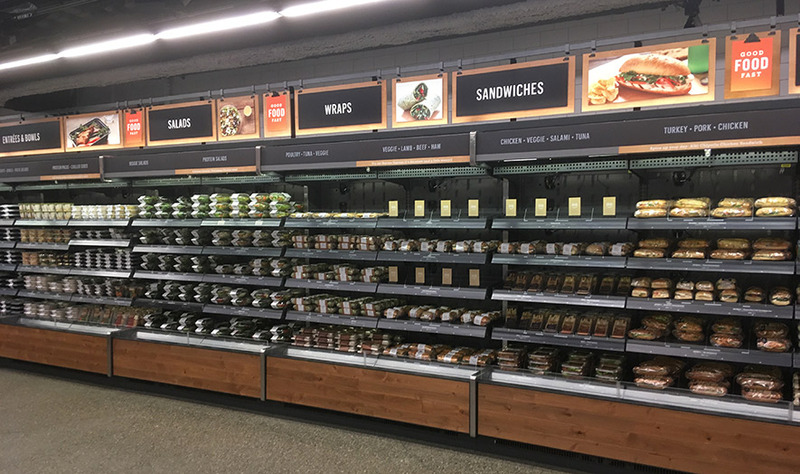 SEATTLE -- After visiting Amazon Go, the recently opened smart convenience store, there is no doubt in my mind that this is the future of physical shopping. Everything is so clean, easy and direct that it doesn’t even feel like shopping. It’s dizzyingly simple. The same could be said for AmazonFresh Pickup, the e-retailer’s online grocery pickup service. Grocery shopping is normally an hourlong affair, at least, but Amazon’s pickup service takes care of all of the guesswork. Had I not taken a couple of minutes to take pictures, I would have been in and out of the drive-in service within two minutes. While in Seattle, I also visited the cashless Starbucks downtown. What struck me most about this location is the normalcy of it all. I spent more than four hours sitting in view of the register and chatting with the customers and staff. No one balked at being restricted to cashless payment options. There were no delays, and the only detail separating this Starbucks from others was a sign or two explaining why the location does not accept cash. 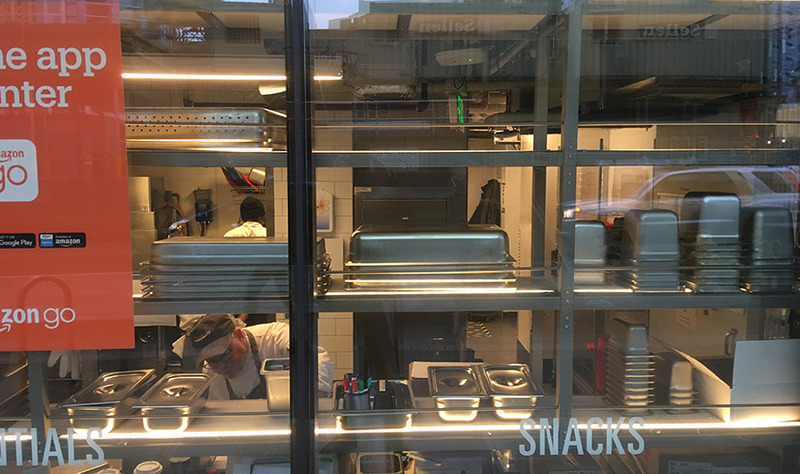 Approaching Amazon Go, the first thing I noticed was the kitchen that passersby can look into from the street. From the theater of at least three employees chopping ingredients and packaging and stocking items to a kitchen filled with stainless-steel countertops and appliances, the store sends a message that it offers more than just packaged goods. 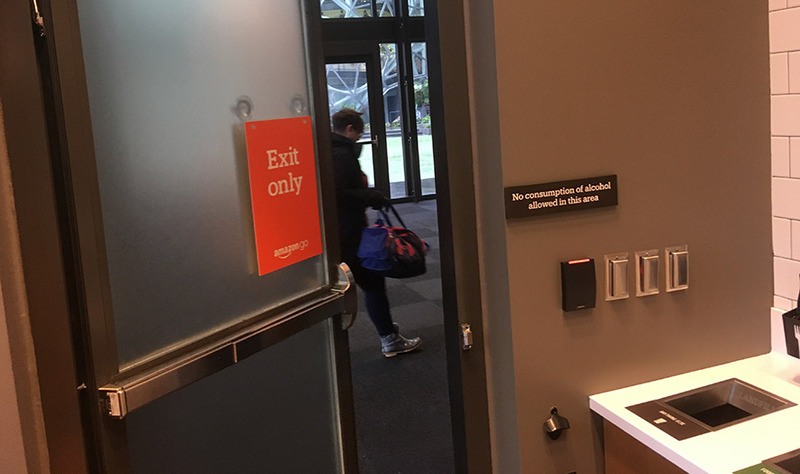 As I neared the door, an Amazon employee handed me a bright orange, reusable bag and checked to make sure I had the app, through which all my purchases would be made, and knew how to enter and use the store. Seeing the camera around my neck and the 10 minutes I spent taking photos outside, the employee handed me a nondescript business card directing me to a nondescript Amazon public relations email—no fuss, no muss. Entering the store, I was greeted by another employee near the turnstiles who is there to answer questions and make sure customer entrances go smoothly. A security guard stood silently by, as well. When I entered, I tried to swipe the QR code on my phone along the sensor on the turnstile. I did this out of muscle memory, because this is the action I take to get into my office at work. But all I had to do was hold the phone above the sensor for a moment. Then I was welcomed inside as the glass doors slid open and a cheery chime sang from the turnstile. Before going through the turnstiles, customers can turn left and enter a small dining area with a few seats, some microwave ovens, plastic cutlery, napkins and areas for trash and recycling. Everything in the store is surrounded by technology, but it doesn’t feel that way. Unless visitors look up to inspect the black-box sensors dotting the ceiling, it almost seems like any other store. The videos online make Amazon Go’s interior seem much bigger than it is in reality. I suspect much of the 1,800 square feet of store is taken up by the kitchen in the back. The store is brightly lit with warm light. The signage is all black, gray or orange. The colors really pop. Directly across from the turnstile entrance is a grab-and-go section with premade meals and snacks. There are sandwiches, wraps, salads and more lining the wall. Tucked away in one corner to the left are shelves of candy and other sweet packaged snacks, along with bottled water and other packaged beverages. To the right of the entrance, an endcap displays Amazon-branded mugs, reusable water bottles and more. Just to the left of the Amazon endcap are shelves that exclusively hold Whole Foods Market snacks. Beyond this, packed into a corner of the shop near the entrance to the kitchen, is a small but well-stocked area of beer and wine. There is no liquor. There is a low partition separating this section from the rest of the store, and an employee stands at a post to check IDs and ensure no one underage takes any alcohol. The right side of the shop also includes meal kits. Meals available to purchase and prepare at home include a salmon donburi bowl, za’atar chicken, parmesan pork loin and falafel patties. 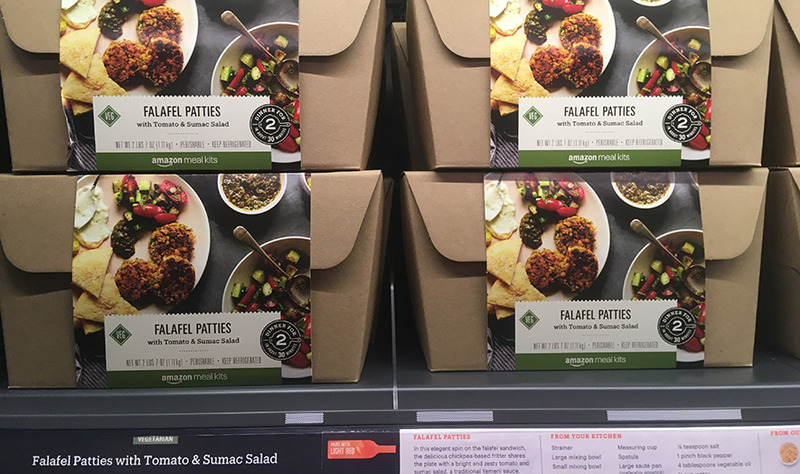 The meals seem similar to options from meal-kit provider Hello Fresh. Finally, the right side of the store also holds miscellaneous packaged snacks, ranging from chips and salsa to granola bars and crackers. Overall, the product assortment resembles that of a health-focused grocery store more than most convenience stores. There are no auto-care items, no electronic products, no ATM, no lottery and no car wash. It’s just customers, food and cameras watching your every move. The customers varied widely during my 45-minute visit. Some were clearly locals, but it was hard to tell if the clientele was mostly locals or tourists. 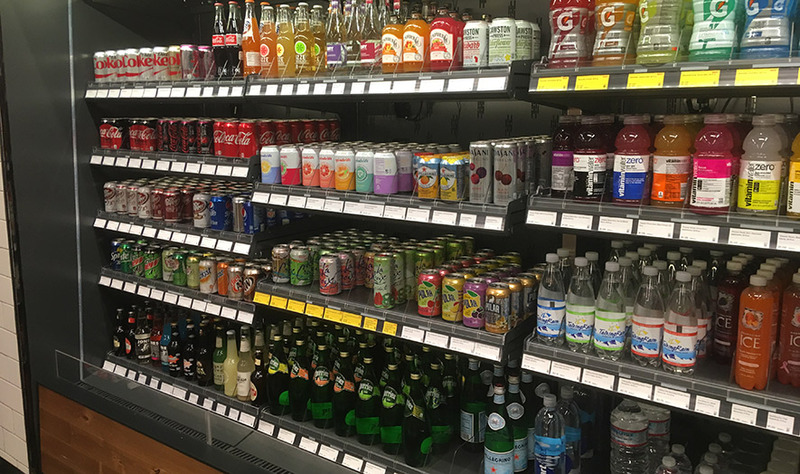 One customer stopped an employee and mentioned that he was not charged the city's sugary-drink tax last time he visited and purchased a soda. The employee said the store doesn’t charge the soda tax. The customer was happy but incredulous. Most of those perusing the store weren’t there to shop. Like me, they were there to take everything in. One man was video chatting with his daughter on his phone as he stood in the center of the store, slowly spun around to give the camera a view of everything and said, “This is the future,” more to himself than to his daughter. The employees manning Amazon Go were friendly, and happy to answer any of my questions about how the store works. But when I asked about anything more specific, like the number of employees or how sales are doing, I was handed another business card and told to wait for a public relations representative who never materialized. Technically at Amazon Go, there are no returns, only refunds. 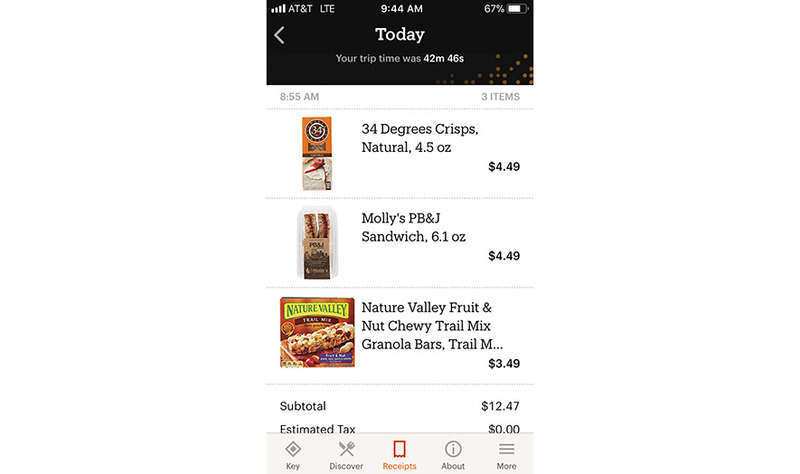 If the store charges something to a customer’s account by accident—or even if a customer decides he or she doesn’t want an item anymore—customers can simply swipe left on their receipt in the Amazon Go app and opt to receive a refund. To properly test Amazon Go’s sensors and cameras, I took a box of crackers off the shelf and placed it back four or five times before ultimately placing it in my bag and taking it with me. Minutes after leaving the store, I received a notification on my phone through the Amazon Go app that my receipt was ready to view. The notification told me exactly how long I spent in the store, which was a little creepy. And even after I had tried my best to fool the system into thinking I didn’t take those crackers, the system was not fooled. There were the crackers at the top of my receipt. Unlike Amazon Go, Amazon’s online grocery pickup service has been up and running for public use since May 2017. Any Amazon Prime customer in the area can place an order for pickup at least four hours in advance. An extra monthly fee of $14.99 allows Prime customers to place an order just 15 minutes before they arrive to pick it up. I placed my order the night before: 1 gallon of milk for my friend Raul, a local who graciously drove me to the pickup station in Seattle’s Sodo neighborhood the next day. Customers can place an order either through the Amazon mobile app or online. I opted to order through the app, but I found it difficult to find the page within the app to place a pickup order. I had to search for the function specifically within the app. There does not appear to be any button or direct path to reach the AmazonFresh Pickup section of the app. While I had trouble navigating the ordering process for AmazonFresh Pickup, the pickup itself was much simpler. When Raul and I arrived and parked in a designated lot, an employee from the storefront across the street immediately approached the car and asked us for the name on our order. Once we gave him the name, he returned to the storefront. Moments later, another employee walked to the car, grocery bag in hand, asking if we would like him to place it in the back seat or the trunk. We asked him to place it in the back seat. Allowing a stranger to open your car door feels a little intrusive, but going grocery shopping without exiting the car was worth it. Imagine the convenience with a larger order. 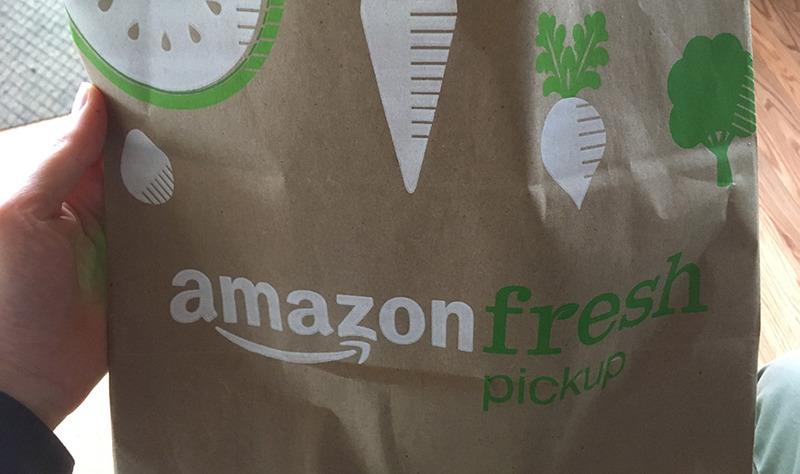 AmazonFresh Pickup gave me the same sense of stunning simplicity that I experienced in Amazon Go. While we waited in the car for our order to be brought to us, lights in front of the parking spot indicated how much longer we had to wait for the order, which was less than two minutes. Shortly after we left the pickup station, I received an email asking me to rate my experience at AmazonFresh Pickup. I chose the smiley-face option. 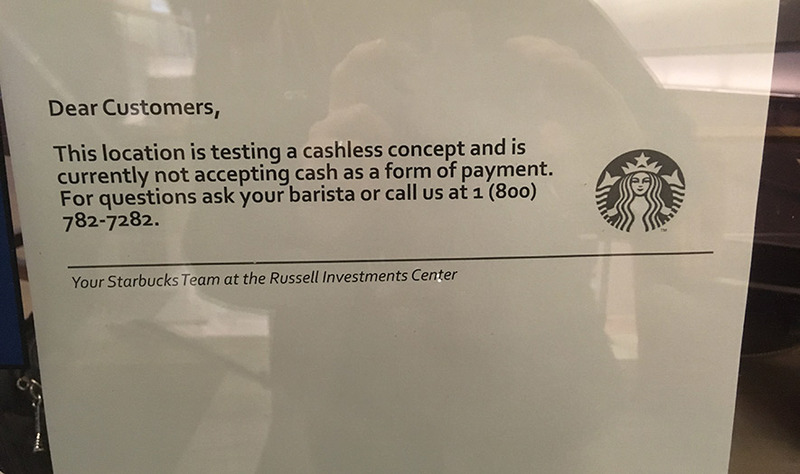 From there, it was onto one of Starbucks' worst-kept secrets, a cashless cafe test site. After spending a good part of my day in the cafe, he seemed to be correct. For the staff and customers here, there does not seem to be anything difficult or out of the ordinary about a cashless unit. However, there are a few details that make this location an optimal test site for a no-cash system. The unit is located on an upper floor of the lobby of the Russel Investment Center downtown, an office building attached to the Seattle Art Museum. There is no Starbucks signage outside, which is especially confusing to a nonlocal because the Target across the street also includes a Starbucks, and that location has outside signage. Based on my time spent in the cashless cafe, it seems like most of the customers here are office workers or regulars. While anyone can enter this location, they have to look for it to find it. There is little doubt in my mind that if I lived in Seattle, I would visit Amazon Go if I found myself nearby and in need of a snack or quick meal. Similarly, I would do most of my grocery shopping through AmazonFresh Pickup if given the chance. There was no lack of human interaction at these locations, either. Employees were constantly walking through Amazon Go helping customers and stocking shelves. AmazonFresh Pickup requires you to speak with another human to confirm an order and receive it. Whenever I talk to convenience retailers, I try to get a sense of their feelings regarding Amazon as a potential competitor. The most common response I hear is that consumers prefer interacting with humans more than interacting with machines, and that Amazon can’t possibly compete on that front. From my experience, that’s simply not the case. Every Amazon employee I spoke with was polite and accommodating. They were ready to answer questions with a smile and help any customer with any need. The future is here, and it’s not just frictionless. It’s friendly, too.